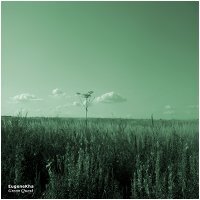 Our friend, Russian electronic maestro Evgenij V. Kharitonov, returns to Earth Mantra with another beautiful release under his EugeneKha pseudonym called Green Quest. We have always been struck by the diversity of musical styles that Evgenij takes on, and this album is a textbook case in point. Where his previous Earth Mantra releases covered such territory as dark ambience, space music, and electronic soundscapes, with Green Quest he ventures into the worlds of light ambience and new age. Fully embracing traditional concepts like melody, formal structure, and acoustic instrumentation, this is a collection of lovely, peaceful pieces that are simply delightful. Interestingly, we glimpse moments of Eno-esque mood music amid all the tonality. Is this a collection of new age pieces that blend in touches of ambience, or is this ambient music with new age overtones? We find it difficult to categorize this music, for it exists somewhere in the netherworld between the two, a fascinating blend of styles. In the end, however, it really doesn't matter how one labels the music, for it is a musically satisfying and utterly soothing listen that will appeal to a broad variety of listeners. One might deduce from the album name that there is an ecological theme happening in this album, and one might be correct. But this is not the sort of music-with-a-message that raps you on the knuckles and instructs you to pay attention. Although the titles certainly give it away, the music itself subtly reinforces the Gaian theme, through Evgenij's masterful use of visuals and field recordings. As we listen, in our mind's eye we envision warm pools of crystal clear water surrounded by lush greenery, towering pine trees penetrated by buttery shafts of sunlight, and whispering fields of tall-grass stretching as far as the eye can see. Truly imaginative work that succeeds on multiple levels. So it is with great pleasure that we welcome back EugeneKha to Earth Mantra and proudly present Green Quest to our audience. A gorgeous collection of refreshing music that we think our listeners will enjoy immensely.